Steven was born in Dumfries, Scotland, in 1982. His talent was apparent from an early age and he was often found drawing on the blank pages of books around the house. Growing up, Steven often sketched the iconic images from album covers and music books and these influences have stayed with him and can be seen in the use of pop photography in his contemporary still lifes. Steven remained passionate about art throughout his childhood and early teens, and won various national competitions and prizes for his work. Steven followed his inevitable path in art, gaining his HND in Art & Design at George Street School of Art in Dumfries after leaving school. This was intended as a stepping stone towards a degree in one of the four main Scottish art schools. Steven decided to move north to Dundee after being enchanted by the city and the art school’s traditional approach. 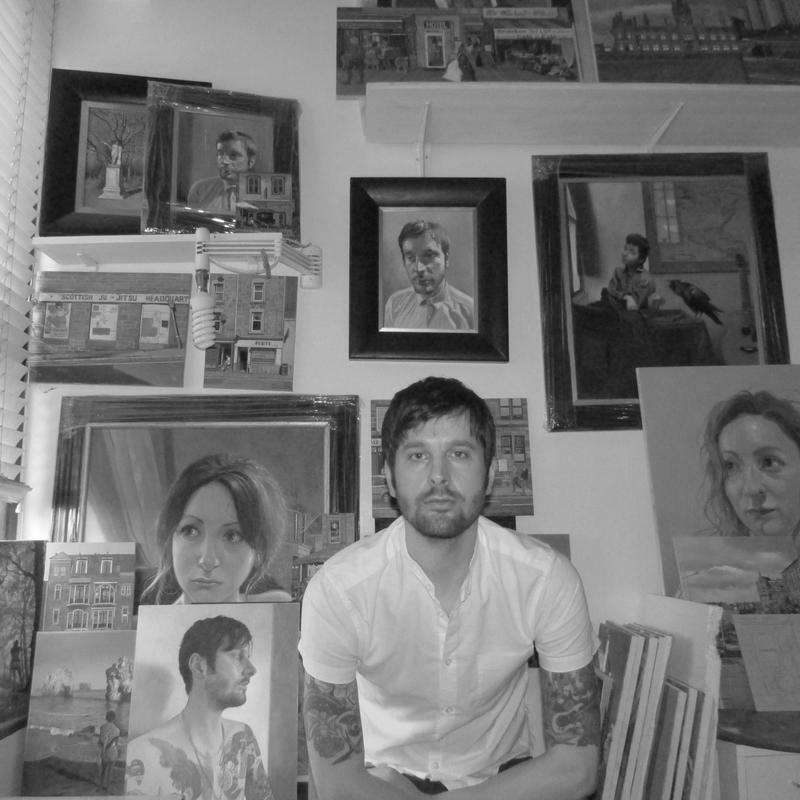 He began studying for his degree in Fine Art at Duncan of Jordanstone School of Art in 2001. Steven spent the first two years of his course studying traditional techniques in oil and watercolour through capturing local cityscapes, landscapes and people. He also spent time in life-drawing classes honing his technique. In his degree show year, Steven put his new skills into practice and produced some impressive large-scale autobiographical paintings which captured the dynamics of human relationships within urban landscapes. Steven was awarded The Aiden Threlfall Traveling Scholarship from the Goldsmith’s Company in London in 2004, the same year of his graduation. He used the highly-prestigious scholarship to spend time in Paris, Venice, Rome and Madrid studying works of the old masters, namely Velazquez, Caravaggio and Manet. Since graduating, Steven’s work has been exhibited widely in galleries across Scotland and beyond, and he has built up a network of collectors across the world.